Low Vision refers to impaired eyesight that cannot be corrected by regular eyeglasses or contact lenses. At Peninsula Vision Associates, we are dedicated to improving your quality of life if you have Low Vision. Our caring and expert optometrists, Dr. Laurie Capogna, Dr. Brandon Marlatt and Dr. Kristin Beckers, will provide you with comprehensive eye exams and recommendations for helpful low vision devices. Located in Niagara Falls, Ontario, we’ve been taking care of eyes in the Golden Horseshoe region for over 10 years. Our new, first-rate Low Vision Clinic offers you all the eye care services necessary for evaluating and assisting with Low Vision. As a registered vendor of the Assistive Devices Program, we can help you receive benefits for the purchase of many prescribed low vision devices that we supply (some restrictions apply). A wide variety of eye diseases and conditions can be responsible for Low Vision, which is a common problem. These ocular disorders include Diabetic Retinopathy, Glaucoma, Macular Degeneration and Retinitis Pigmentosa. 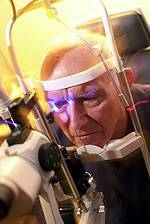 After age 65, Low Vision is the third most common physical impairment. Only arthritis and heart disease occur more frequently. No matter what the cause of your Low Vision, we will assess your eyes fully in order to provide the most appropriate aids for your visual condition and lifestyle needs. Our Niagara Falls, ON office boasts state-of-the-art facilities and equipment for Low Vision Care. With skill and experience, our optometric team will evaluate your vision requirements and design your rehabilitation regimen. Our goal is to assist anyone with Low Vision to overcome the challenges posed by reduced eyesight. Depending upon your unique visual goals and problems, we will match you with the best Low Vision Aids. At our specialized clinic, Low Vision Care is provided as an ongoing service to patients in the regions of Niagara Falls, St. Catharines, Niagara on the Lake, Welland and Ft. Erie. To help with visual impairment, we work together as a team. At your initial evaluation, our eye care professionals and rehab experts will consult together with you. This first meeting generally lasts one to two hours, as we take the time to get to know you, your health and your needs. Follow-up visits take approximately 30 minutes each, and are often required as a part of the Low Vision Care process. Keep in mind that while Low Vision Care cannot restore lost eyesight, we can maximize your remaining functional vision through the use of low vision aids. Vision aids are special lens systems that are customized to illuminate or magnify images. This enhances visual acuity. Our eye doctors in Niagara Falls, ON, will introduce you to these devices and train you in the best, proper methods for use. Patients who are covered by OHIP may receive coverage for our eye examination. The vision aids that we recommend for you are not generally covered by insurance plans. However, the Assisted Devices Program (ADP) often covers up to 75% of the cost of most visual aids. The patient must pay the remaining price difference. Contact our office to schedule a Low Vision Evaluation! At Peninsula Vision Associates, in Niagara Falls, ON, we will be pleased to evaluate your vision and assist with enhancing your eyesight. We offer a full range of Low Vision Aids, and we will make recommendations for you, as well as train you in how to use the devices. Click here for more information on Low Vision Aids.